GUARANTEED Australia wide DELIVERY HAS NOW CLOSED. We can possibly get a door to door delivery same day in Brisbane on Thurs 18th April or Sat 20th April - please call for a price, usually in the range of $25-$35. Limited stock is still available. 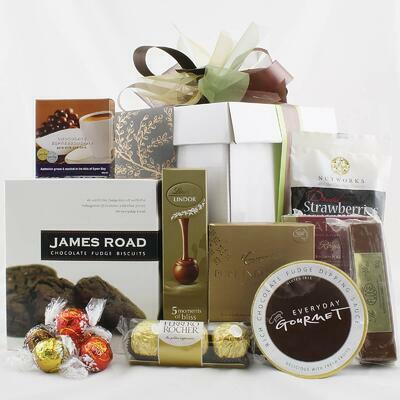 Easter Gift Hampers delivered across Australia. Each Easter our gift range is updated in plenty of time for your Easter gift giving needs. 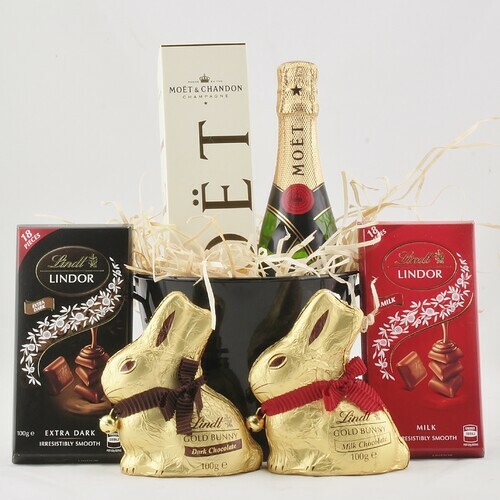 Our range of Easter gift hampers and gift baskets are an indulgent selection of Swiss, Belgium and Australian made chocolates. Be sure to check back here in March, when we are sure you will be able to find a Easter Gift Hamper suitable. With Easter just around the corner, it’s time to start thinking about what chocolates and gifts you want to buy your loved ones! Don’t settle for standard chocolate eggs and Easter bunnies at your local store. You can give so much more by choosing Easter gift baskets and Easter hampers filled with goodies that everyone can enjoy. 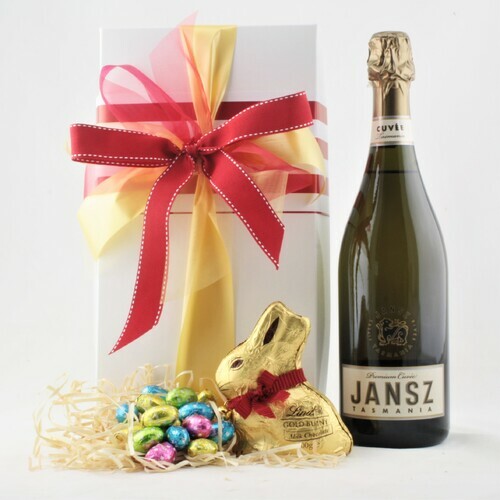 At Hamper Me, we include premium, locally sourced chocolates, Easter themed gifts, nibbles and beverages in beautifully packaged hampers and baskets. Each Easter, our gift range is updated in plenty of time for your gift giving needs. Our range of Easter hampers and gift baskets include an indulgent selection of Swiss, Belgium and Australian made chocolates. Be sure to check back here every March and April to see the Easter gift baskets and hampers we have available. 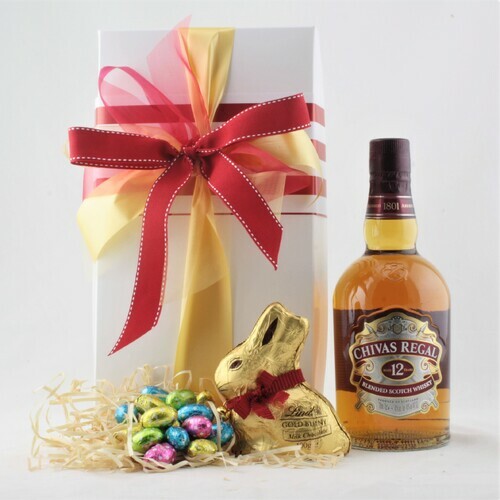 Bring joy to everyone in your life with vibrant Easter hampers perfect for children, as well as classy Easter themed gifts for adults which include delectable chocolates with fine wine and tasty snacks. With 16 different Easter gift baskets and Easter hampers to choose from, you will be spoilt for choice! We are also happy to custom make the perfect gift basket or hamper for that special person in your life. 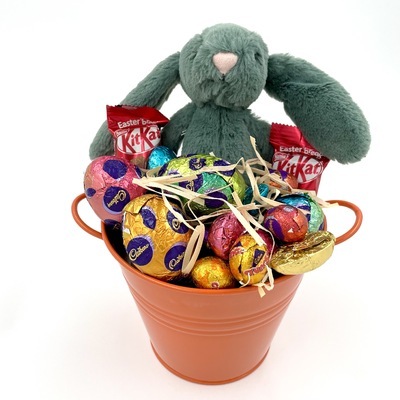 Just give us a call on 1300 085 949 and we will work with you to create the ideal Easter themed gift. Surprise a special person this Easter by delivering an exquisite handmade basket full of goodies for them to enjoy. 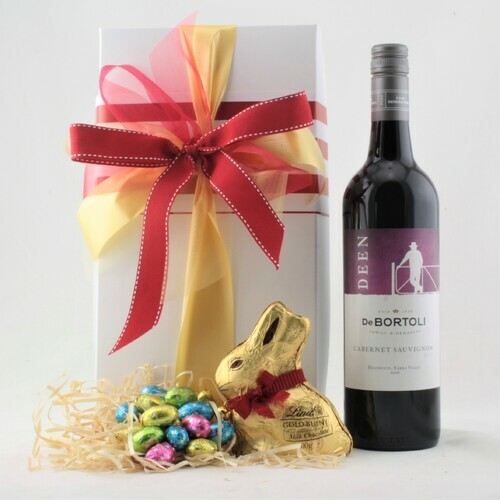 Our Easter gift baskets and hampers can be delivered to any residence or workplace across Australia and it is bound to be a surprise that anyone will love! The person receiving your gift will feel extra special seeing the high quality products they have received, and how much care has been put into wrapping and decorating the gift hamper or basket. It is so easy to place an order with us online. Just select the Easter gift basket you would like and proceed through the purchase process. 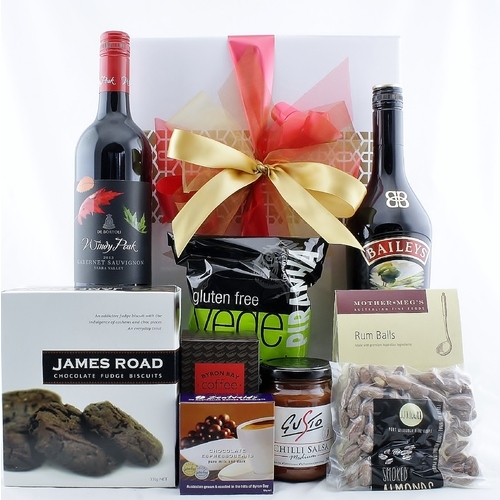 All of our hampers can be delivered across Australia to all major capital cities and regional areas. Most metro areas can expect to have their hamper delivered within the next business day while residents in the Brisbane CBD and inner suburbs can receive same-day service. You are welcome to contact us if you are ever stuck on choosing the best hamper. We are also happy to customise the ideal gift basket to suit your requests. Rather than hunting down the best chocolate eggs and gifts in the store for your kids, save the hassle and don’t spoil the surprise by having an Easter hamper delivered to your home instead! The smile on your kids’ faces when they see the basket of goodies they received from the Easter bunny is priceless. You know better than anyone what your kids will enjoy most for their Easter surprise. 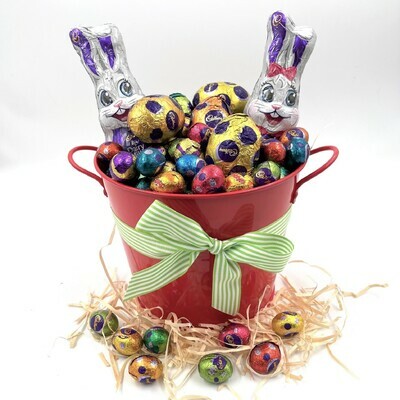 Perhaps your children would enjoy a big bright bucket overflowing with chocolate eggs and rabbits? Watch their eyes pop when they see how much chocolate is in the epic Bucket of Easter Eggs gift basket. If you would like to give your little one a big cuddly bunny and some super special chocolates from Chocolatier, the Easter Speckles hamper may be an excellent option for you. 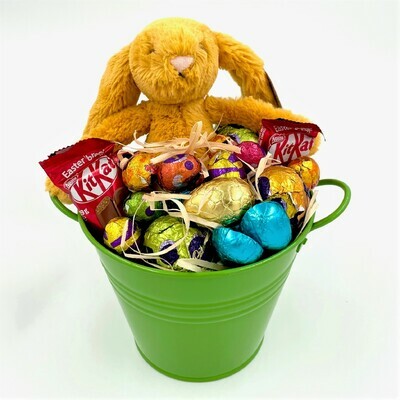 We also have the Easter Honey Bunny hamper which includes a smaller sized plush bunny and a variety of chocolates from Cadbury, Lindt and Chocolatier. There is no reason why adults shouldn’t enjoy Easter as much as the kids. That is why we have a special adult’s only range of gift baskets and Easter hampers with all of the goodies you will ever want! There’s no doubt that chocolate is a must for most people at Easter time, but what would make the perfect addition to your sugar fix? A tasty bottle of wine or Baileys of course! 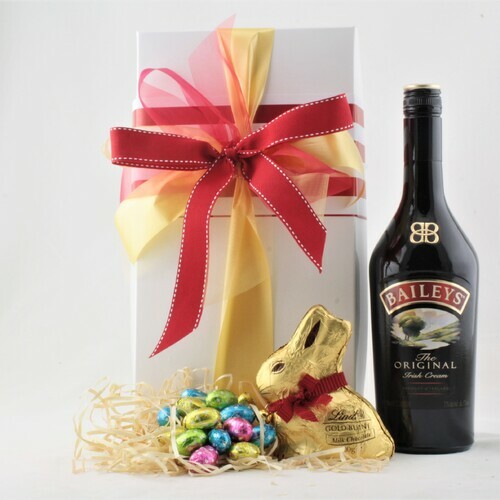 If chocolate and wine is more than enough for a thoughtful gift at Easter, you may like A Sparkling Easter or A Baileys Easter hamper. If you would prefer to give a gift with a little bit of everything, try Simply Addicted which is filled to the brim with chocolates, crumbly cookies, hard candy, a bottle of wine and so much more. And if chocolate is all you need, our Easter Surprise Boxes will have anyone getting into the spirit of this fun-filled holiday! We also have gift baskets that can cater to adults and children alike! 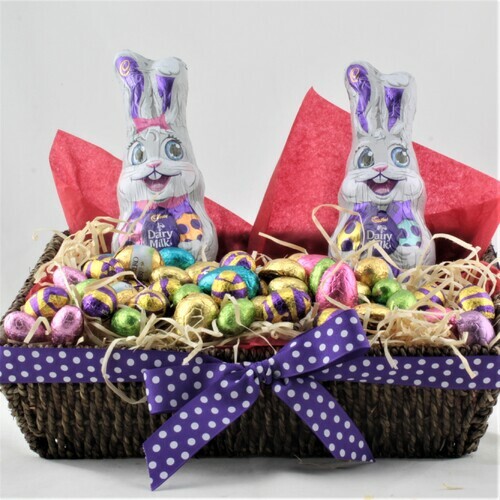 If you would like a nice all-rounder Easter gift that both children and adults can enjoy, the Easter Fun hamper has a combination of Chocolatier speckled bunnies and eggs as well as Cadbury and Darrell Lea bunnies and chocolate. 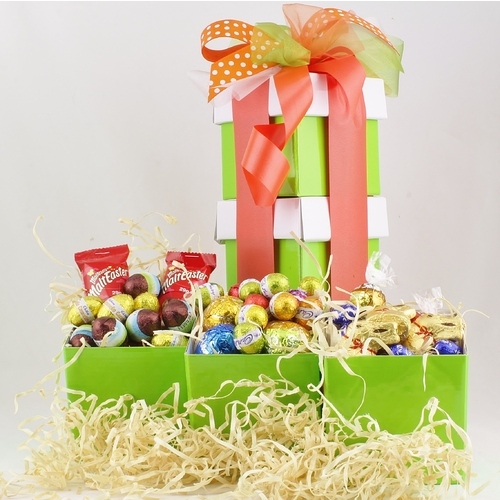 All chocolate tastes are covered in this yummy Easter box. We can even satisfy those with a particular chocolate craving in mind, such as the Lindt Easter Basket that includes all of your Lindt favourites, perfect to share at Easter time. 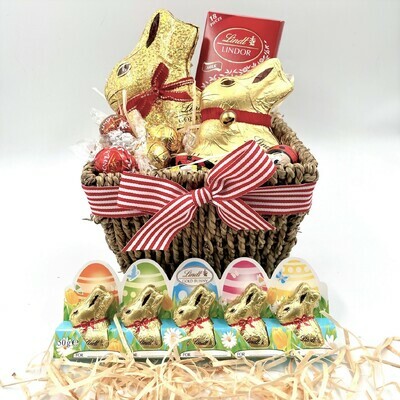 This gift basket also includes an adorable set of Lindt branded bunny ears, great for both adults and kids to wear and get into the spirit of the season. 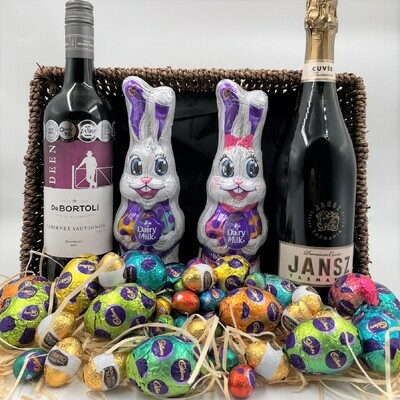 When it comes to finding the perfect presents for Easter, you will not find an easier way to get your gifts and chocolates sorted for loved ones across Australia than with Hamper Me. Thanks to our high quality locally sourced products, award-winning customer service and high attention to detail when decorating and packaging your Easter gift baskets, you will be pleased you chose us to deliver hampers for you this Easter. Click through to each of our Easter hamper pages for full product details and order online today! You can also call us on 1300 085 949 if you have any questions about our service, or if you would like to work with us to create a customised hamper. 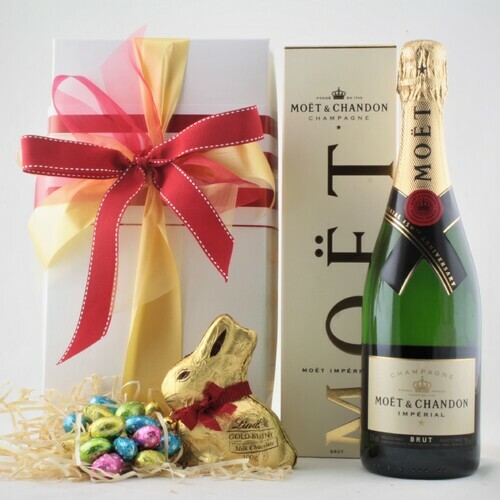 So if you’re tired of looking for chocolate and Easter presents in the shops and want a gift that will stand out from the rest, save the hassle and choose to deliver an exquisite Easter hamper or Gift Basket instead from Hamper Me.